I bought each of these toys for under $5 a piece! The bunny is great because it’s also a teething toy, Kyler really seems to like it. The giraffe is easy to hold and rattles as well. The mobile is really cool because you can either attach it to your stroller or on the car window! Every child prefers a certain toy more than others seem to but these are a few Kyler seems to enjoy! Of course we have a million other things that we bring with us on trips but these seems to be the easiest/smallest and keep him occupied just fine. Traveling… We’ve traveled to the East Coast twice with Kyler so far. That’s about a 13 hour total trip! The first time we flew he was 4 months old. He did awesome! He slept most of the time and the time he was up he ate, giggled and played shy. People were even asking us if we’d given him some sort of drug to make him so good! I was very impressed and not scared of traveling at all! Now, not ever baby is the same! 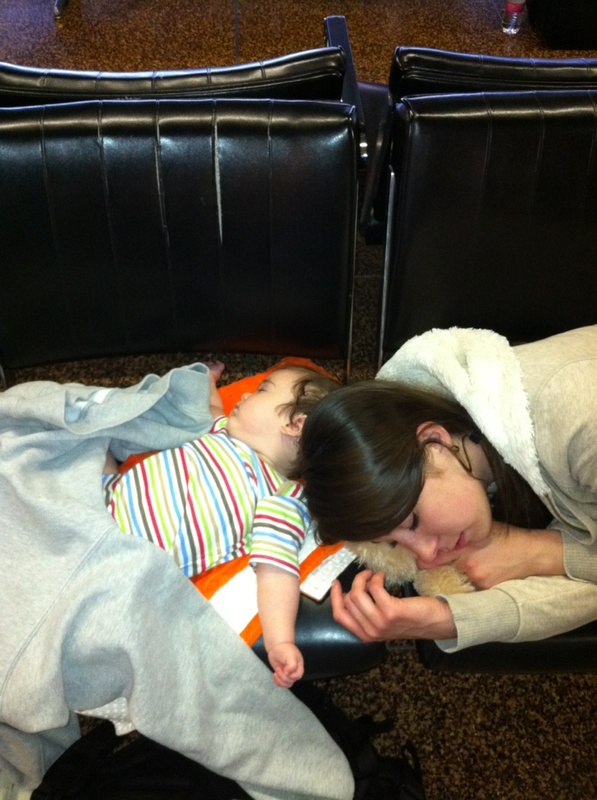 We had a little girl a few seats behind us and she was screaming and not sleeping at all. I was so happy that the crying baby was not ours. Since we didn’t get an extra seat he laid across my lap the whole time which seemed perfectly comfortable for him but 13 hour trip later I was certainly tired and uncomfortable. I didn’t mind being the crazy person rolling around on the floor with my baby! The second time we flew he was almost a year old… It wasn’t as easy as the first time only because he didn’t sleep as much. We didn’t get him his own seat which I would highly recommend! He moved around too much and wanted to bounce from Daddy to me, me to Daddy… He still did awesome and only didn’t like the time waiting on the plane to take off and the time waiting to get off. We always sit next to the engines that way it’s as noisy as possible and it seems to lull him to sleep. All in all, he’s a great traveler and we’re lucky!